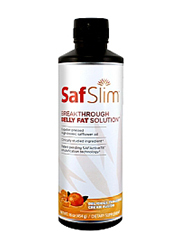 ﻿ SafSlim Pills Review: Is it Safe? This creamy liquid mixture features just one active ingredient intended to give off fat loss properties alongside diet and exercise. 4 flavors exist, one of which has a taste award dating back to 2011. If one ingredient is the key supporting figure then surely it has strong enough presence to provide some change. Still you should have a full analysis to compare and contrast between all the available products intended to keep you from piling on the weight. Using the power of fatty sunflower oil this product is intended to reduce fat and it has been emulsified in order to digest easier within the stomach. It relies on a heavily monounsaturated fat called High linoleic safflower oil. This form of safflower oil tends to keep from becoming rancid for a long time. It also has monounsaturated fats which are found in large quantities in dairy products, meat, and avocados. Mediterranean diets are typically high in this fat and the belief is that it protects against heart disease. One has to take this product for 16 weeks and limit carbohydrates and trans fat with diet and exercise to see the results promised by the company. While it does have a positive effect to supplement with beneficial fats, there is not enough compelling reasons why one should take this brand. At $32.99 for a 15 day supple it doesn’t even hit the 16 week mark that the company suggests will bring on the positive effects. Cheaper sources are available with less of a time frame for supposed effects. You can decide what is the best option for your needs right here. Different flavors are available, one of which has been ranked high due to its taste. Too many disgruntled customers exist and the product is insanely expensive demanding 16 weeks to see results. Although the product brands itself to be wholesome and all natural there is ingredients such as sorbic acid which are artificially created. Also many customers (184 negative Amazon.com reviews) have reported lacking any positive effects. Some have even added they increased their gout and some even mentioned they hit the scales, their weight actually increased instead. Keep in mind one has to spend over $200 in order to hit the benchmark of 16 weeks for results to finally kick in. Results that take this long (if they even come at all) are far too long in the future to really be considered worth the investment of time and money. While there are many disgruntled customers you can still compare and contrast. Decide for yourself if SafSlim is really worth your time.. Although the product throws some interesting figures the customer input has been mostly negative with some even complaining of actually increasing weight. It is clear that a sudden increase in fats is not enough for most people, and at this price it is far too pricy to really justify. Much more substantial options exist that can produce the effects you need for weight loss. Some may benefit from this liquid but clearly there was an overwhelming negative response which resounded louder. In order for you to make the proper choice take a peek at the highly favored customer approved supplements..